Take a Look at the 2215 Spartan from Texwrap! Are you looking to add an entry-level L-sealer to your operation? Have you considered integrating a wrapper into your production line but, unfortunately, found yourself intimidated by the cost? If that’s the case, we encourage you to take a look at the 2215 Spartan L-Sealer from Texwrap. 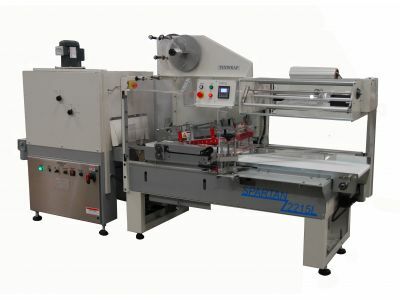 Designed to integrate into lines where space – or cost – is a concern, the 2215 Spartan is one of Technical Packaging Systems’ most affordable – and most efficient – wrappers. Packed with essential features and built to the same standards that Texwrap is renowned for, the 2215 Spartan is one of the most versatile entry-level machines on the market. In this post, we’re going to examine some of the benefits afforded by Texwrap’s 2215 Spartan L-Sealer. With a laser-cut, heavy steel frame, the 2215 Spartan offers a level of durability that imported machines cannot match. This American made L-Bar sealer is built to last. Additionally, a premium powder-coat finish ensures that the machine looks right at home next to the other equipment in your line. Driven by a standard 115 volt AC power supply, the 2215 Spartan can be plugged into any standard wall outlet, ensuring fast, seamless integration. The Spartan also features a hand wheel that allows for quick, easy package height adjustment and an easy-to-reach film scrap winder that is conveniently located at eye level. Featuring “constant run” capabilities, the 2215 Spartan’s infeed conveyor can run continuously, allowing for efficient – and fast – product feeding. In addition to this, the machine offers a maximum film/belt speed of 80 FPM, ensuring that your line moves at a brisk pace. At Technical Packaging Systems, we are committed to providing a range of packaging options that address all needs and all budgets. From complex, fully-automatic shrink wrappers to efficient entry-level models, we offer the industry’s best equipment and, more importantly, the expertise that you need to select exactly the machine that you need. So, if you’ve been looking for a great – and affordable – entry-level L-Bar machine, contact us today to discuss the benefits of the 2215L Spartan from Texwrap!